Through spiritual significance and adventure of musical art, our church celebrates the beauty of faithful and Christ-centered living with the universal and historical diversity of the body of Christ. People of all ages can find a place of growth and service within a musical group. Martin Luther, the main catalyst of the Protestant Reformation, sought to make music a spiritual relationship with Christ available to all people. The Music Ministry at Advent Evangelical Lutheran Church seeks to provide the same philosophy of worship and musical growth. Our music ministry seeks to connect everyone to God and to one another through meaningful, faithful, and spiritual worship. 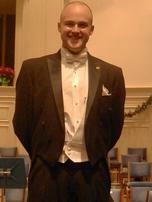 Advent Lutheran Church would like to announce the installment of the church’s new Director of Music, J. Matthew Swingle. How would you like to contribute to the ministry?